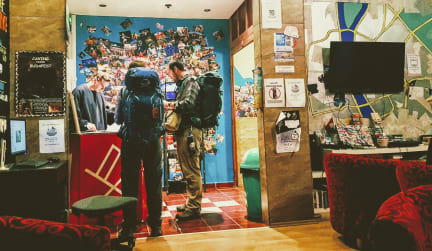 Meander Hostel i Budapest, Ungarn: Bestill nå! Et av de beste hostellene jeg har vært på! One of the better hostels I've stayed at! The crew arranges all sorts of cool events, such as open mic nights and boat trips! If you want to party, you can, but the party is never at the hostel, so finding some peace and quiet is possible too. The staff is VERY friendly and helpful, they know everything you need to know about what do to and see in Budapest as well. The kitchen is well equipped, common room has board games, and security is darn good. Can't wait to come back!